The year was 1955 and Harmony came out with a new, bright , shiny, original look. Ahead of their time or 30 years too late, these Harmony guitars took on a new concept of color. These bright, flower power colors of the 60's the Deco look of the 20's merged together to give these Harmonys a unique look. The Harmony Caribbean Guitars, named after their delicate pastel and metallic finishes, were given their name because of the colors found in the fabulous vacation spots of the tropical seas to the south. These bright colors were set off with metal trim. 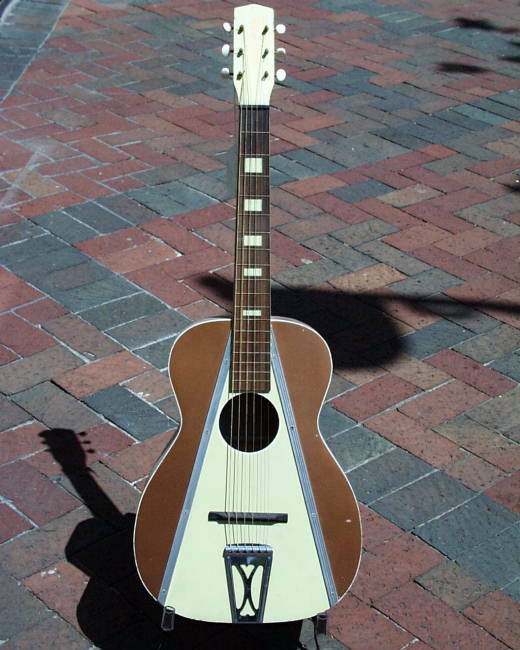 This made for an unusual looking guitar with lines that resemble the deco look of the 1920's The Flat tops guitars had six different Holiday Colorama color combinations and were as distinct looking as any guitar I've seen. Colors like Spring Green, Sahara Yellow, Copper, and Tangerine made for a festive line of guitars. Even the line of archtops from 1955 took on the Holiday Colorama theme. The Monterays came in several different patterns and color schemes. The Model 952 had matching red fret markers to set off the bold red graphics on the top of the guitar. The Catalina Arched Guitar was the predecessor to James D'Quisto's blue guitar that Scott Chinery modeled his Blue Guitars from. With their Pacific Blue and Dawn Blue color combination, they were as blue as guitars get. 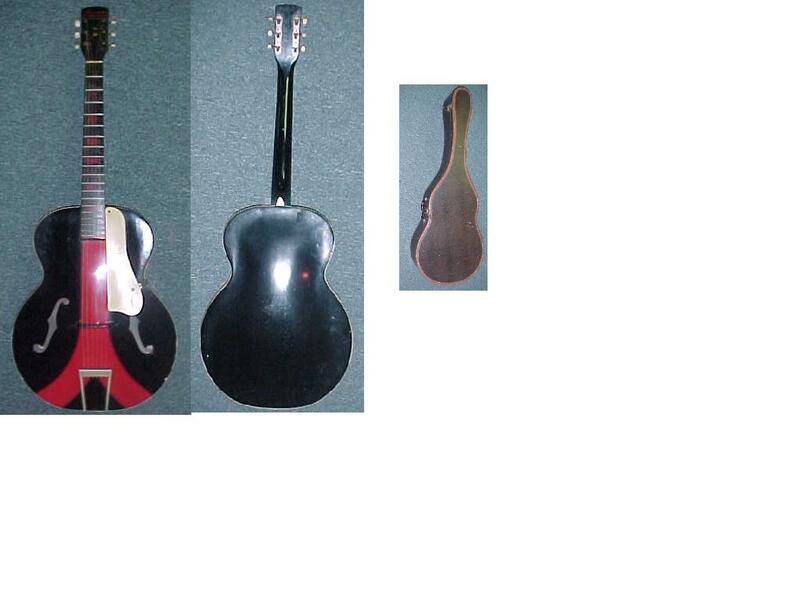 These auditorium size guitars were dependable, hardwood construction with celluloid pickgaurds. The Harmony Montclair was at the forefront of modern guitar style. Available in both auditorium and grand auditorium sizes, they were finely crafted with ovalled fingerboard, and celluloid bound edges. 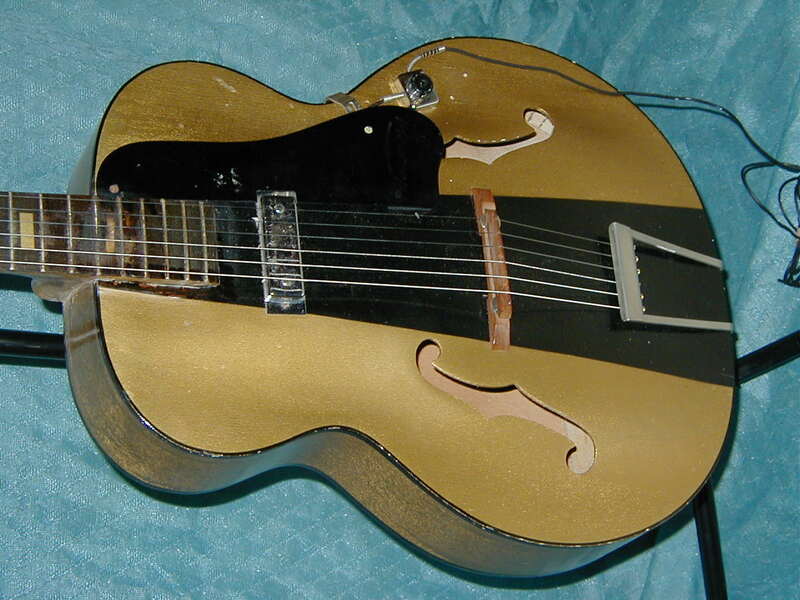 Nothing compared in uniqueness than some of the electric archtops from this period. The most unique looking guitar I've seen is the Harmony Espanada, with its metal binding. This model H-62 guitar, although similar to the H-64 of the 60's was interesting because of its metal binding. This top of the line, quality guitar, was black polished finish, had two pickups, and wide bands of fluted harmometal, binding. This binding was designed to protect the edges on the guitar, but was more reminiscent of the edge found on the Formica countertops and kitchen tables of the 1950's extraordinary instrument for the advanced player. Also produced was the non-cutaway Riviera. Boasting the metal as: "harmometal" meant the newest in styling, the most perfect protection, the most all around beauty. The 50's saw a basis for later Harmony guitars. They still had their H-62 and H 60 Electric Spanish cutaway guitars, along with other non-cutaway electrics. 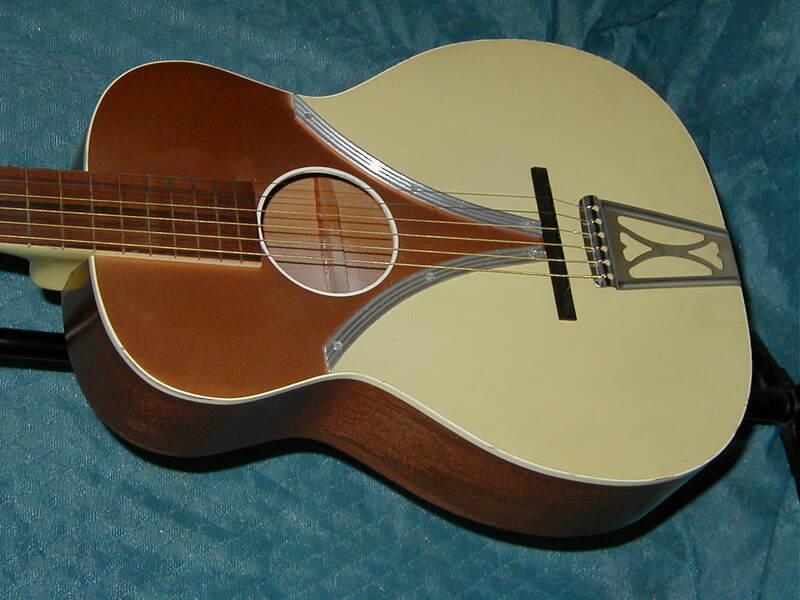 Harmony's new "Uno-tone Guitar," acoustic electric Spanish flat top was an new concept in guitar playing. It also was a forerunner to the Acoustic Electric guitars that have become quite popular today. Most interesting were some of the earliest Stratotone guitars. These solid body electrics were the predecessor to what was to come in guitar playing. At this time, Leo Fender was developing a solid body electric guitar that would revolutionize guitar playing. Harmony still had their line of Ukes and other instruments but these Colorama guitars seemed to be the main core of the line. Ahead of their time, these Harmony guitars are some of the most interesting American made instruments to date. The bold color and unique binding, along with their other innovative manufacturing ideas, made for some real gems from the 1950's.